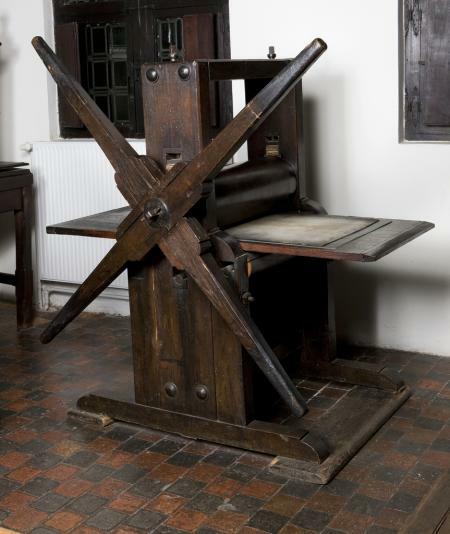 I have an artist colleague who is planning a painting which will include a printing press. He’s interested to find out what sort of press might have been used to print early US currency. Anyone out there have any ideas? One of Ben Franklin’s early jobs was printing currency for New Jersey (I believe it was); that job was most likely printed relief/letterpress. He would have been using an English common press owned by his employer which, if I remember right, he transported to the venue of the job. So a press like that exhibited at the Franklin Institute or several other museums (though unfortunately NOT the Smithsonian) would have most likely been what he worked the currency off on. A quick check reveals that “His first experience printing money came in 1728 while working for Samuel Keimer.” A few years later he printed some currency for Pennsylvania in his own shop. Copper plate intaglio presses were available prior to and during the 18th century and used to print currency. For example, in 1727/28 Benjamin Franklin and Samuel Keimer spent time in New Jersey to print an issue of paper money that the New Jersey Assembly had called for. To do this they used a copper plate press that Franklin had managed to assemble for the purpose. See the first photo below for a press of the basic style they would have used. Even earlier in 1702, John Cony engraved the paper currency for Massachusetts. He is also thought to have engraved that colony’s bills of credit in 1690. Thomas Sparrow of Annapolis was a silversmith who also made bookplates and other engravings including some for an issue of paper money. Prior to 1775 he was the only “Southern” engraver. For obvious reasons, it was not an uncommon practice for silversmiths to use their engraving skills for printing. In the 19th century also bank notes, stocks, stamps, and misc. certificates were printed on hand-operated intaglio presses. The U.S. Bureau of Engraving and Printing and the American Banknote Company, to name but two, used such presses extensively. The Kelton D-cylinder “Spider-Type” press was specifically designed for production printing of these items and incorporated several unique features to facilitate fast, efficient printing. Companies such as those above had hundreds of these presses in operation daily. Each proof was basically a unique work of art since each plate was inked separately by hand, the inking and wiping requiring considerable skill. I’ve posted a few additional photos below showing the Bureau of Engraving and Printing around the turn of the century. The first photo shows a copper plate press circa 1714. These presses continued in this basic form until the early 19th century when they were gradually replaced with those made from cast iron. Thanks for the replies thus far, especially to Rich for answering so thoroughly. I’ll send a link to this page to the artist I mentioned; I’m sure he’ll be thrilled and grateful, as am I.